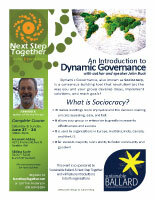 This event is co-sponsored by Sustainable Ballard, Next Step Together, and Governance Alive. It includes an introduction to Next Step Together and Sustainable Ballard. Download and print or email our flier! facilitated by John Buck and Friends!